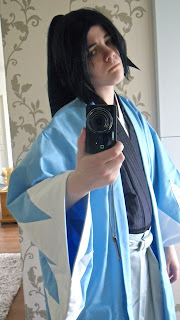 Shiro Samurai's Cosplay: I got stuff for Hijikata! 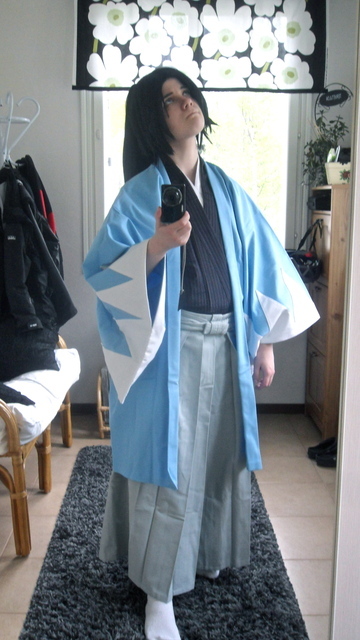 I took some WIP photos of Hijikata so far. Excuse mirror photos again..
What's left to do is the headband and add haori himo ties to the haori. The swords are at Jäätynyt Enkeli's place already. The hakama and shinsengumi haori are commissioned by my friend Hasakitsuki's mom. Thank you so much. <3 I could never have made it myself in time for Uppcon because I was busy finishing Desucon cosplays and blah blah. So this cosplay is mostly commissioned and/or bought. It seems my Uppcon cosplay plans will change too, I'll make a blog post about that later. Gin Ichimaru and Toshizo Hijikata are set though. 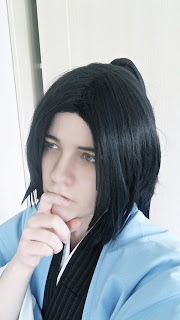 It seems I'll change Ichito for Hajime Saitou but I'm not sure yet. I can't take Ukitake because the swords got damaged from the Desucon trip.. the golden paint rubbed against and transferred on the black parts of the blade. I need to repaint it and fix one of those ribbon holder square things because it broke already last year at Närcon by accident but so far it's been held together by Jesus tape.. but now it's giving in. Need to make a new one. YEY Hijikata! Mun tekis mieli tehä itelleni tollainen Shinsengumi Haori vaan sen takia et voisin sit posettaa sen kanssa XD Ota sit paljon kuvia siel Uppconissa! ja pidä hauskaa! Sorry om det med svärden. Va det Ukitake shikai versionen? D: hoppas det fixar sig!